There are a number of young people who write to communicate things that they cannot with spoken words, just as Emma does. Many of them are starting blogs of their own, some have parents who have blogs and like Emma they are beginning to take ownership of those blogs. 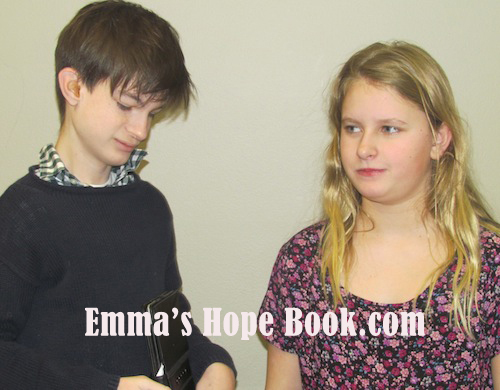 On the “Resources” page here on Emma’s Hope Book I’ve listed a great many blogs beginning with those written by non-speakers, or people who write to communicate. When Emma wrote “so many kids are just like me” I thought about how when Emma was diagnosed I knew of none (of any age) who wrote to communicate. The entire concept was completely foreign to me. In fact, and I hate admitting this, I hadn’t spent any time considering neurology, literacy, language, or which parts of the brain process language. I remember being confused by the idea that someone who didn’t speak, could still read. I’ve come a long way! I would like to take the opportunity to list here just a few blogs that I personally know of where people around or near Emma’s age are writing to communicate. This is by no means a comprehensive list and I welcome any additions, which I will add here and on the resources page as they come in. This morning I told Emma she had to take a shower and wash her hair. “Just Emma. Bye-bye Mommy,” Emma said as she ran into the bathroom, closing the door firmly behind her. This is great, I thought. She’s at an age where she needs privacy, all developmentally appropriate. Later Emma joined me in the kitchen where Nic had just appeared, hair wet and sticking straight up in the air, as he too had just washed his hair. Nic rolled his eyes and sat at the dining room table listening to who knows what on his ipod. Nic either didn’t hear me or pretended not to hear me. Either way there was no response. “Hey Nic!” I said again in a louder voice. Nicky! You need to brush it!” Emma parroted. Nic ignored both of us. “Emma! Be quiet!” Nic shouted with irritation. “YOU HAVE TO BE QUIET!” Emma echoed. “Nicky! Stop talking!” Emma yelled. “Why are you smiling?” he demanded. “Mom! You’re totally smiling. Why are you smiling?” Nic punched me. “Nicky!” Emma shot over on her scooter and thrust the hair brush at him. Emma then began to try and brush Nic’s hair. “Oh my god Mom! She’s torturing me. Make her stop!” he said, as Emma attempted to brush Nic’s snarled hair. “Ouch! She’s hurting me!” Nic said with feigned pain. He held his head between his hands and pretended he was in agony. “Okay Em. Give Nic the brush. He’ll brush his own hair,” I told her. “Emma do it,” she insisted. “No Emma. Seriously. I’ll do it,” Nic said, grabbing the brush from her. “No Em. You brush your own hair,” I said. “Already did brush hair,” Emma said indignantly. “Now it’s Nicky’s turn,” she said before racing off on her scooter. The diet update – I spoke with Emma’s physician about the diet yesterday. Since Emma did not test intolerant for gluten and because we’ve seen no significant change in over six weeks, we are putting gluten back into her diet. This morning Emma ate Cheerios with rice milk. “Well that should decrease the anxiety,” Richard commented when he saw the box of cheerios on the counter. “I meant yours,” he said. Yesterday I was shown a video of Emma with one of her classmates, Charlie. Each year Emma has had someone she particularly likes. Someone she will talk about and want to sit next to. Last year it was an adorable little boy named Justus, the year before it was Ben. This year it is Charlie. Charlie doesn’t have much language, but they connect on another level. In the video Emma and Charlie are hugging each other and Emma is doing something with him that I have only seen her do with her older brother, Nic. She is running her fingers through his hair while laughing. The two of them are so adorable with Charlie beaming and Emma laughing, the two of them hugging each other and then Emma puts her hands on his shoulders, while maintaining eye contact she bends from side to side and bops her head up and down. Charlie follows her lead and they laugh while doing a kind of dance together; watching it made me cry. Something so simple. Something seemingly so small. Two children laughing together. Two children connecting with each other. For me it was akin to receiving the Nobel Peace Prize. Dr. Marion Blank has written a terrific piece for the Huffington Post regarding the 60 minutes segment on APPs for autism and the current ways in which language is taught. For anyone with even a passing interest in language or autism, I encourage the reading of it. Emma ate about three tablespoons of chicken and brown rice two nights ago and tasted the pumpkin mousse I made. I will attempt to make coconut milk whipped cream this evening in preparation for our Thanksgiving feast. I want to have several things Emma might like, so I am planning to prepare Maple Syrup glazed Turkey, roasted carrots and sweet potatoes and some kind of desert she might enjoy (she didn’t love the pumpkin mousse or pumpkin scones, so I’ll try some other recipes) as well as things the rest of us will enjoy – we are having between 12 – 15 people, many of whom are bringing things! I am thinking of writing a cookbook entitled All The Delicious Things I’ve Made That Emma Won’t Eat. I worried the other day (someone pointed out that I am always worrying about something – I blame my mother for this – she is a known worrier, plus I’m a New Yorker so there’s no hope for me) that Emma is just as rigid now as she was before the diet. Instead of only eating six things, all of which were dairy or wheat, she now eats six other things, but as Richard pointed out, at least they aren’t dairy and wheat. I think my expectations were high (they tend to be) when we began the diet; I had read in many cases the child, once off dairy and wheat, expanded their diet dramatically. Don’t get me wrong, it is wonderful to see Emma eating brown rice and roasted chicken. In fact it’s a huge achievement on her part. I’m taking a deep breath now and will bask in the glow of brown rice and chicken. To date we have seen no identifiable cognitive or behavioral progress as a result of this diet. We see her doctor in another three weeks. I am still hopeful we might see something by then. We received a report from her school that Emma threw a chair across the room on at least two occasions and pulled one of the TAs hair. Obviously this is not good news. Another deep breath, focusing on the joys of brown rice and roasted chicken. There is a lot of great news out there regarding autism. Many families have tried biomedical and therapeutic interventions with terrific results. The website, autism.com has great information about treatments that have worked for many children on the spectrum. No one can predict whether any of these will help your child. When I was in my early thirties I sought help from the medical community for my bulimia. I was depressed, could not stop the destructive cycle of binging and throwing up. There seemed little to live for. I phoned several rehabs and after speaking with several doctors and eating disorder specialists, I was told the longer a person had an eating disorder, the more intractable and harder to treat it became. When I mentioned I had been bulimic for going on two decades there was silence. I remember hanging up the phone and feeling utter despair. I felt a similar despair when Emma was diagnosed. But then, as I had when I was still bulimic, I became determined. That determination served me well during those difficult years. I never gave up and eventually found enough people who were able to help me, hold my hand and advise me. I learned I couldn’t recover on my own. I learned how to ask for help. I learned to lean on others. And I learned that in my darkest moments, if I remembered to reach out to someone else in need, to offer to help them, my own problems diminished. I have tried to live my life in this way ever since. Sometimes when I read about other people’s successes with their children, while happy for them, I feel sad for Emma. I believe it’s natural to feel this. I will never give up on Emma. I will continue to do all I can to help her and while I do, I continue to work on my impatience while remembering to be grateful for each moment with her. It’s been a month. Last Monday I wrote that it had been four weeks and two days, I was wrong. It just felt like it had been a month. One month ago, on October 16th we began Emma on a GF/(modified) CF/ soy free and a great many other free diet. This is our second go around with this diet. The GFCF diet was the first thing I did when Emma was still two years old, to no noticeable change. However, that first time she began eating a great deal of soy – soy yogurt being her favorite. I was working with a DAN doctor at the time who tested her for hundreds of foods but never said anything about all the soy she was eating. So after three months we took her off the diet and again saw no change. This time I’m working with a naturepath/physician who also tested her for hundreds of foods. This time, the list of foods to avoid was much longer than the first: cocoa, corn, potatoes, chicken egg whites, all red skinned fruits and vegetables, bananas, peanuts, onions and garlic. Emma did not test negatively for wheat, but he advised we take her off it anyway, just to be safe. Oddly, she also didn’t test negatively for sheep and goat’s milk, so we’ve allowed her to have sheep’s milk cheese, sheep’s milk yogurt and duck eggs. Still we have witnessed very little change in Emma. We’ve grown used to this. I keep thinking I’m going to find something, something that other families have tried with significant results, but so far, other than Emma’s literacy program, we have not. It’s frustrating to try various things and see little, if any, change. As I’ve written before, we think we are seeing an increase in physical affection, but it’s hard to say this with certainty. We have definitely not seen a profound change of any kind causing us to feel without a doubt that this diet has done anything. Still I will give it more time. Why some of these interventions work for some children and not others is something that’s been debated for awhile. Why is it some children are mainstreamed after a few years of intensive 40 hour a week ABA, yet for children like Emma, they were not helped? How is it that some children go on a GFCF diet and within days are transformed from a screaming, frustrated, incoherent child to one who is speaking in full sentences, playing with toys in an “appropriate” manner and displaying a never before seen curiosity of those around them? It is easy to blame oneself, but I don’t believe that is the answer. I know of too many cases where the parent has tried a great many things only to find their child did not respond. I wonder whether it is the children who do respond, who are the exception. While this thought depresses me, I have to wonder whether it isn’t more accurate. A Zen buddhist teacher told me once – anything that happens in life is an opportunity to practice. I remember my feeling of irritation when she first said that to me. As the years pass I think of her and her statement often. Whatever it is that is happening – if I can suspend my judgement and not label it as good or bad, but just as what is, I have taken away one more obstacle. I think of Emma, beautiful, amazing Emma, who is unique and like no other child. Her autism is neither good nor bad, but what is. Even as I write this I can feel the tug in my chest, the little voice whispering to me, no – it is bad. As though by accepting I will have given up. As if my judgement will somehow make it go away. As though the label will somehow change it. I am not in the we-must-accept-and-do-nothing group. I am in the – my labeling her autism or anything else for that matter as bad does not take it away – camp. It just adds one more thing that I am fighting. My practice is to continue the fine art of balancing what is with what I wish to be. What I wish for, what I hope for, what I work so hard for is to help Emma become more independent. To celebrate her strengths, to encourage her to sing, to join her in her joy of music, to push her to work on her spelling, reading, writing, typing, math and language. To gently lead her away from her rigidity, to embrace her silliness, to urge her to explore and be curious. While I am doing that, I continually remind myself that each moment is a moment that simply is. Emma is and for that I am eternally grateful. 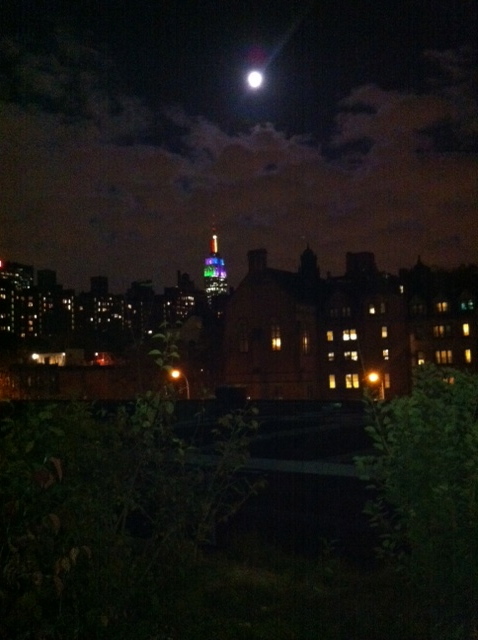 New York City Empire State Building taken from the High Line last night. The New York Times published a piece in August of this year about the role the environment plays in the rise of autism. It begins with the question asked by many people who are hoping to become parents – What can we do to decrease the risk? I have often thought about what I would have done differently, knowing what I now know. There are a number of things, things I didn’t know to do or not do when I was pregnant with Emma. There are a few things that appear to have some scientific basis to them, such as taking prenatal vitamins at least three months before getting pregnant and continuing to take them for the duration of the pregnancy. I began taking them when I learned I was pregnant with Nic, though interestingly, with Emma I was taking them before I became pregnant with her and continued throughout the duration of my pregnancy. I would not have eaten any fish of any kind during any part of my pregnancy. I ate grilled swordfish a couple of times in my second trimester with Emma. I also used fingernail polish remover a couple of times and had my hair highlighted once during my third trimester. I would have stopped using all artificial sweeteners and I would have been more careful after the 9/11 attacks by not going downtown to Richard’s office in Soho to work. Beyond those incidences, I did not take any drugs of any kind, not even aspirin, I didn’t consume caffeine or alcohol, I did not have an amniocentesis, avoided all and any invasive procedures, had two sonograms and gave birth naturally in a birthing center. It seems unlikely that anything I did while pregnant contributed to her autism, but who knows? After giving birth I would have done a number of things differently. From the moment she took her first breath I would have eliminated all onion, garlic, dairy and wheat from my diet while I was breast feeding. During those first few months when she was so uncomfortable and “colicky” I would have kept a food journal to see if there were other foods I was consuming that upset her and then eliminated those. Since Emma seemed so uncomfortable when I breast fed and much preferred drinking breast milk from the bottle, I would have tried different techniques in swaddling her or having some sort of soft cloth between us so our skin to skin contact wasn’t so uncomfortable for her. I would have started brushing therapy (click link for more detailed information on brushing) with joint compressions (see link for a detailed description of joint compression exercises) during this period as well. Then there are the things I wish I had done much sooner such as Dr. Marion Blank‘s literacy program instead of all those hours spent doing ABA. I wish I had discouraged Emma from sucking her thumb. I would not have introduced corn, soy, wheat, dairy or any foods that are thought to be problematic for some children. I would have obtained an evaluation much sooner as well as taken her to a neurologist and had an MRI done before she was 18 months old. Had I done all of those things, would any of it made a difference? Except for introducing Dr. Blank’s program right away, which I am convinced would have made an enormous difference, who knows? How much of a role does the environment play? How much is due to genetics? I have questions, lots of questions. None of which will likely be answered any time soon. Last night she ate a tiny piece of catfish and coconut rice. I soaked the catfish fillets in beaten quail eggs and almond milk, then drenched them in a mixture of coconut flour, quinoa flour & oat flour with some salt, before sauteing in ghee. The coconut rice has become my new favorite dish. Instead of cooking the rice in water I use coconut milk, making it creamy with a slightly nutty flavor. However Emma is not quite as enthusiastic by my culinary inventiveness as the rest of the family. Still, she did eat some and then was allowed to eat her new mainstay – green grapes and honeydew melon. Except that when I offered her a few pieces of honeydew melon this morning she began to scream as though I’d amputated a limb. As I’ve said before, she’s one tough customer. In addition to all of this, ideally she should be on a rotation diet, meaning no food is to be repeated for at least four days. (Laugh hysterically. Then try to calm down and remember to breathe.) Um. Right. That short dialogue sums it up. As far as any changes we’ve witnessed – we think we may see an uptick in her desire for physical affection. It’s hard to say this definitively, but we have all been getting more spontaneous hugs and kisses it seems. I think her eye contact is better, again, it’s a subtle shift, if at all. She has become more perseverative, so on the advice of her doctor we’ve reduced the Malvin, Piperine and one other, whose name eludes me at the moment, drops back to two daily instead of three. I cannot tell if her chronic constipation is better as I have no way of knowing what she does, if anything, at school. She does not seem particularly uncomfortable, but then she rarely does. Emma also takes a magnesium supplement, Taurine, one drop of dopamine, several multi-vitamins as well as cod liver oil, which bizarrely, she actually seems to like. And, because of this diet I now have become versed in such unlikely ingredients as – Guar Gum, (used as a thickener in place of cornstarch, it comes from the Guar or cluster plant grown in northern India and Pakistan. The seeds are hulled and ground into flour) Xanthum Gum, (also used in many gluten free recipes as a thickener and to add volume to baked goods. It is derived from corn. However, because it is derived from corn sugars and during the process, all corn sugars are removed, it should be okay for Emma. This is according to her doctor. I did find a corn free xanthum gum from Namastefoods.com, just to be safe.) Arrowroot, (used as a thickener, found in South America, got it’s name from being used to treat wounds from a poisoned arrow.) How’s that for a bit of trivia? You will not learn how this diagnosis will affect your marriage or other members of your family. You will not be told how it may fundamentally alter your perceptions of what is “normal”, how it may change your view of human beings, how it can force you to question small talk and why we behave the way we do, how it will transform your outlook on life, how it will change you, how your life and everything you assumed to be true, is no longer what you thought. Having a child with autism may cause you to feel things you never dreamed possible. You may know moments of joy and moments of despair you could not have imagined. You may find yourself going to untold lengths in the hope of helping your child. You may feel distracted, unable to concentrate. Your work and career may suffer. You may learn what it is to be sleep deprived. You will come to know what it means to feel desperation. You will know sorrow in a way no one can prepare you for. You will know happiness in a way no one can prepare you for. Sometimes you may feel both sorrow and happiness within the same day, within the same hour, within the same minute. You may spend money you do not have on yet another treatment, yet another doctor, yet another specialist, yet another therapy, yet another intervention, all the while rationalizing that if it helps, it will all be worth it. You may contemplate doing things you would have scoffed at before your child was diagnosed. You may find yourself doing things that defy logic and have no medical basis. You may listen to implausible, anecdotal stories and think – we will try that next. You may dream your child is speaking to you in complex, beautifully self aware and revealing sentences. You may wake from those dreams believing for a few seconds they were real and not a dream. You will pray that you might dream again. You will welcome sleep, as you never believed possible. You may ache with sadness because your child is crying and in pain and your presence brings them no solace. You may question every maternal instinct you have. You may feel ecstasy from being hugged, unprompted. You may feel the exquisite joy from having your child reach for you, ask for you, call for you. You may know the joy that comes with seeing your child work so hard at something that does not come easily to them. You may celebrate when they use the correct pronoun, even though they are no longer a toddler, when they learn to get dressed on their own, drink from a cup, say hello to you without being asked or simply acknowledge your presence. You may feel a gratitude you would not have believed possible. You may cry from happiness when they say a word, any word, even if you are the only person who can understand what the word is. You will know what it is to appreciate commonplace things – eye contact, the correct use of the words “me”, “you” and “I”, physical contact initiated by your child, a word, any word spoken. You will feel a fierce love for your child that seems to come from a place that is not of this world. You will know what it is to love unconditionally and you will understand what that really means. After receiving an autism diagnosis for one’s child, most people go to the internet to learn more. Quotes like this one abound. What these sites do not say, cannot say, is what will specifically help your child – What interventions, if any, will make a difference, what biomedical, dietary & behavioral approaches will work? “Conclusion Autism is a very complex disorder; and the needs of these individuals vary greatly. After 50 years of research, traditional and contemporary approaches are enabling us to understand and treat these individuals. It is also important to mention that parents and professionals are beginning to realize that the symptoms of autism are treatable–there are many interventions that can make a significant difference. A parent of a child with autism quickly finds they will need to read enormous amounts, speak with a great many “specialists”, sift through the endless opinions (often stated as fact), and try to make sense of all the various articles, papers, news items and books currently in print on autism. In addition they may watch the numerous documentaries, interviews, YouTube clips and all the other visual forms that exist relating to autism. Having done all of that a parent must make decisions as to what they can and cannot do, what they can and cannot afford to do in their attempts to help their child. While they are making these decisions, they must cope with their own emotions, trying hard to keep depression, worry, panic, fear, sadness and guilt at bay. They must learn to manage these feelings while continuing to research and do what they are able to with the hope something they try might just help their child. But most important perhaps, we must never give up. We must try in our darkest hour to see the light. We must treasure our child’s differences, celebrate our child’s uniqueness, rejoice in our child’s strengths. Years ago Richard and I went to a couple’s therapist. He listened to us both individually and then asked us to meet with him together. As we sat side by side on his couch he told us he didn’t want to hear about our latest disagreement, he was much more interested in hearing from each of us what the other had done right in the last 24 hours. We were told to go home and keep a journal, recording all the things the other had done that was kind, thoughtful and helpful. He encouraged us to examine each act, to consider things we perhaps took for granted. It was the single most helpful advice anyone ever gave us. This blog is a version of that exercise. While I do my best to accurately document Emma’s progress or lack of, while continuing to try different interventions, I also try my best to celebrate her. Let me concentrate on her strengths while I continue to do everything in my power to help her build on those same strengths and perhaps she’ll discover new ones. I have a tripod with a hotlight set up for the trunk show I’ve been doing these past two days. I turn the hot light off whenever possible as it’s so bright and, well, hot. Even though the weather has turned fall-like, the sun pouring in through the windows facing south, serve to warm the place so much that I am often opening windows to let the cool air in. But every time Emma is here she turns the light back on. At first I thought she liked the warmth it generates. Then I noticed she liked to sit directly in front of it, but far enough away that the heat from the light couldn’t be felt. She was sitting in a spot light. The kind of bright theatrical lighting one sees shining on a diva singing an aria. You can tell where I’m going with this. This morning, just so there would be no mistake, Emma grabbed a toy microphone and began singing and dancing under the glare of the light. We watched Emma crooning away and shook our heads. That’s our little girl – drawn to the lights as only a natural born performer could and would be! On a food side note – Emma ate three forkfuls of the meatloaf I made last night, dipped in applesauce. (My mother used to serve applesauce with meatloaf, which is how I came up with the idea.) Not only is this incredible and unprecedented, but all the more so because I steamed a head of broccoli, 7 spears of asparagus and two large carrots, then pureed them and mixed them in with the meat before putting it in the oven to bake. Last night marked the most vegetables Emma has consumed in seven years! Even though the amount she actually ate was miniscule, it was better than nothing. She also ate two pieces of rice quesadilla. Just to be perfectly clear, not two bites, two PIECES, whole wedges. I bought the rice tortillas from Trader Joe’s, spread it with grated Sheep’s milk cheese and baked it in the oven. A huge success. Then I pushed my luck by making another rice milk smoothie, which she refused, even though I thought it delicious. Yesterday we received a call from Emma’s school because she was hysterical and couldn’t calm down. Evidently a child in her class had a birthday and the parent sent in cupcakes, which Emma couldn’t eat. There are few things Emma loves more than a birthday celebration and cupcakes are an integral part of that. So when Emma wasn’t allowed to eat the cupcakes, she was beside herself. Eventually she was able to calm down, but it took awhile. I was with a client when the call came in and couldn’t speak with her, but told the school I would make cupcakes with her when she returned home. (I have made at least four batches of cupcakes to date, none which she will actually eat. She and Joe made a batch – she ate two right away and a third the following day, then refused to touch them again.) But yesterday I found my old tried and true recipe for cupcakes. Emma has always loved the cupcakes from this recipe, so I substituted gluten free flours and hoped for the best. Emma enthusiastically poured sugar into the ghee, helped whip everything together, occasionally dipping her finger into the batter and eating it – all a good sign. I had her help me spoon the batter into the muffin tins and put the whole thing in the oven. When they were done, beautifully fluffy and perfect looking, Emma eyed them critically before speeding away, saying nothing. “Hey Em, look! They look perfect.” I held one up for inspection. “No?” Emma said in that questioning way of hers. “Oh, Em. Just taste it.” I could see she wasn’t going to like them. I have always taken pride in my culinary skills, but Emma is one tough customer. She did finally taste one before putting it down again and expressing her displeasure. “I can’t believe she doesn’t like these. They’re so good!” Nic managed to say between mouthfuls. Ah well. The search for a cupcake recipe Emma will enjoy continues. In New York City, a great many people, adults and children alike get dressed up for Halloween. And not just those who walk in the epic Halloween Parade that begins in the village and winds its way north until it ends just a block from where we live. (This is in explanation to those of you who might think we’re peculiar – though we probably are.) 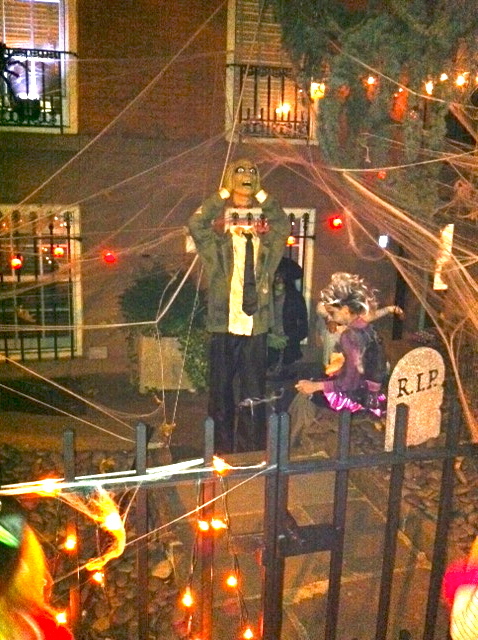 We live in Chelsea where at least eight blocks of brownstones go all out for Halloween. New Yorkers take their Halloween very seriously. The brownstones don’t just have a couple of fabulous pumpkins on their stoops, the building’s facades are covered in cobwebs, enormous black hairy spiders hang from windows and doors, strobe lights blink, Halloween themed music blares from speakers rigged outside (Michael Jackson’s Thriller is a big hit), a coffin with a corpse that suddenly comes alive decorates a front garden, dismembered limbs hang from trees, a couple of the brownstones even used dry ice to create a fog that meandered down the block. People travel from all five boroughs to trick or treat on these eight blocks, they have become so renowned. Richard upstaged all of us though. Every now and again I would turn to find him nowhere in sight. Ten minutes later he would catch up, having been grabbed by someone who insisted on having their photo taken with him. 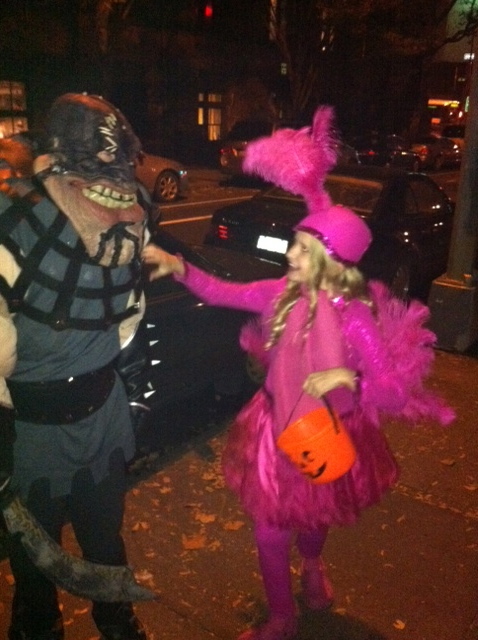 One of the dozens of shops open late for Halloween – This unicorn was one of my favorite costumes – look at the pose! “No, that’s okay, Em. You don’t need to taste it.” I smiled at her. “Just lick it!” She began unwrapping the lollipop. “It’ll make you sick,” she said, putting it back in her halloween basket.